For large batch sizes of liquid products we offer a high speed (up to 200 bottles/minute) liquid filler with integrated capper. The liquid filling is done by rotating piston pumps, ensuring 0.5% accuracy even at large fill volumes. The liquid filler and capper is purposely built for very quick changeover. The changeover is not only fast, but can be done by using half as many format parts as our competitors. The capper is designed for automatic height adjustment via the HMI. For round containers it is not necessary anymore to change the rake or in-feed guides, the only parts to swap are the bottle clamps. The spacing unit that separates the bottles at the infeed is format free, the recipe in the HMI automatically adjusts it to the required product. 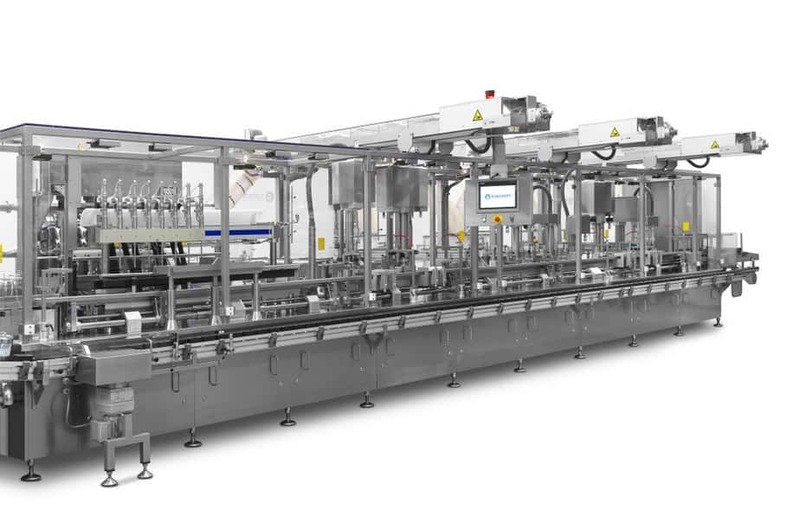 We have liquid packaging lines with dedicated machines for each step such as bottle unscrambling, bottle cleaning, liquid filling, capping, retorquing, labelling and topserting. Our F-AVR machine uses scroll for separating containers and rake transport for precise positioning for the liquid filling and capping stations.